Günther “Hupatz” Seeger was born on 9 September 1918 at Offenbach in Main. He joined the Luftwaffe in 1937 undergoing his fighter pilot training at Werneuchen. Seeger was posted to JG 2 on 26 February 1940. Gefreiter Seeger was assigned to 3./JG 2. He recorded his first victory on 8 June, when he shot down a French Morane fighter near Soissons. During the Battle of Britain 3./JG 2 was based at Beaumont-le-Roger. Seeger claimed a further three victories, including two RAF Spitfire fighters shot down on 7 September 1940, to raise his victory total to four. From 27 March to 19 June 1941, Seeger served with Ergänzungsstaffel/JG 2 fulfilling an instructing role. 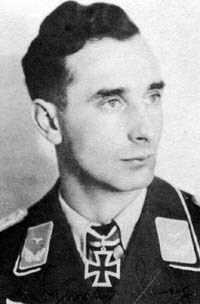 He returned to front line duty with the Geschwaderstab/JG 2, based on the Channel front, as Rottenflieger to Wilhelm Bathasar (47 victories, RK-EL, killed in action 3 July 1941), then Walter Oesau (127 victories, RK-S, killed in action 11 May 1944), Rudolf Pflanz (52 victories, RK, killed in action 31 July 1942) and Erich Leie (118 victories, RK, killed in action 7 March 1945). By the end of 1941, Seeger had 19 victories to his credit, including three victories on 23 July, all RAF fighters, to record his 10th through 12th victories. Seeger was transferred, once again, to Ergänzungsstaffel/JG 2 on 10 November 1941. He returned to front line duty with 3./JG 2 on 10 January 1942. Over the Allied landings at Dieppe on 19 August, Oberfeldwebel Seeger shot down three Spitfires to record his 20th through 22nd victories. However, he was also shot down in the engagement and baled out of his Fw 190 A-3 (W.Nr. 0536) “Yellow 14”. Seeger escaped injury. On 10 September 1942, Seeger again transferred to the Geschwaderstab/JG 2. He then transferred to 11./JG 2 on 4 November. 11./JG 2 was transferred to the Mediterranean theatre to operate from bases in Tunisia subordinated to II./JG 53. Seeger had 24 victories to his credit at this time and had been promoted to the rank of Leutnant. On 3 January 1943, he shot down three enemy aircraft (27-29). In all, Seeger recorded nine victories over Tunisia before the unit retired to Sicily. In February, 11./JG 2 was disbanded and absorbed into II./JG 53. Seeger was assigned to 7./JG 53. Operating over Sicily and southern Italy, Seeger added 14 further victories, including his first four-engine bomber shot down on 22 March 1943 (31). On 12 July, he shot down three Spitfire fighters (37-39). At the fall of Italy, Seeger was sent back to Germany to recuperate from a bout of malaria. In October, during an Allied air raid on Offenbach, his family home was destroyed, his mother killed and his father hospitalised. Seeger was transferred to the Gruppenstab of II./JG 53, based in Germany, on 7 February 1944. Leutnant Seeger was awarded the Ritterkreuz on 26 March 1944 for 46 victories and promoted to the rank of Oberleutnant. He was shot down in aerial combat with USAAF fighters on 13 May. He belly landed his Bf 109 G-6 “White 13” east of Neumünster and was fortunate to escape injury. Seeger was shot down again on 24 May. Again he was the victim of USAAF fighters and made a belly landing near Pritzerbe in Bf 109 G-6 “White 1”. He received minor head injuries in the landing. Following the Allied landings in Normandy on 6 June 1944, II./JG 53 was rushed to France. Seeger claimed four victories before II./JG 53 was withdrawn back to Germany on 12 July. On 13 July 1944, Seeger was appointed Staffelkapitän of 4./JG 53. The unit was redesignated 7./JG 53 on 10 August. Seeger did not participate in Operation Bodenplatte, the attack on Allied airfields in Holland, Belgium and France on 1 January 1945. Rather, he had been granted leave to marry. Seeger was to lead 7./JG 53 until the end of war. He managed to evade capture and made his way on foot to his home town of Offenbach on foot. In 1956, Seeger joined the new Bundesluftwaffe. He reached the rank of Oberstleutnant before retirement in 1974. “Hupatz” Seeger was credited with 56 victories in 504 missions. All his victories were recorded over the Western front and include eight four-engine bombers.